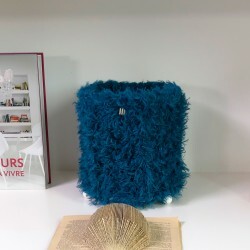 The lampshade "Au diable Vauvert" is worked in fluffy yarn; it is discreetly married in many types of dark interiors, or stands out strongly in bright or colorful interiors. 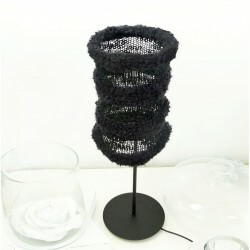 This black floor lamp is available in 3 models. 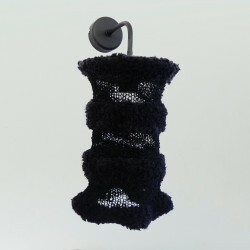 Equipped with knitted BEN Air shades, this black suspension creates unique and continuously changing light environments. 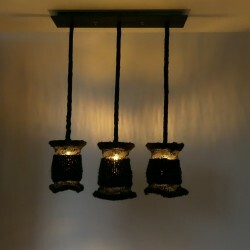 The suspension from the Auckland Collection is a free evocation of the southern lands and the warm volcanoes that scatter it.This suspension is available in 4 versions, from 1 to 4 shades. 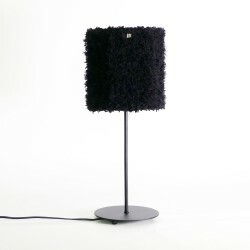 Oran Collection standing lamp.Matt black metal base, epoxy color.The tab shade in this collection is the BEN, a fully hand-made shade with mixed techniques, including knitting. Wall lamp from the Auckland Collection. 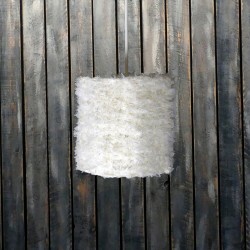 This wall lamp model is available in two versions: UP or DOWN. 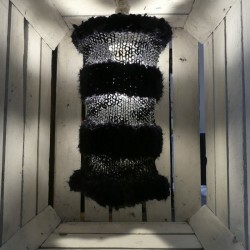 The support is made of curved metal, matt black epoxy color. The BEN shades that equip these wall lamps can also be purchased individually to be placed on wall sconces already existing in the wall. On or off, the Brest suspension creates a Cocoon atmosphere in any type of room.Its buttery-coloured AYA shades evoke the roundness and generosity of the Breton country.In version 1, 2 or 3 shadows, on a daily basis, this suspension heats and illuminates continuously friends' meetings, family meetings, work meetings; In short, all moments of conviviality! 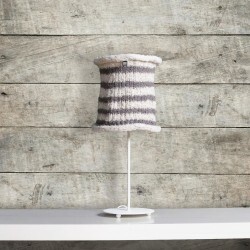 Brest Collection table lamp.Matt white metal base, epoxy color.The tab shade in this collection is the AYA, a fully hand-made shade with mixed techniques, including knitting. 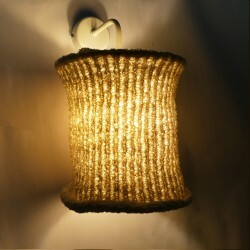 Wall lamp from the Best Collection. 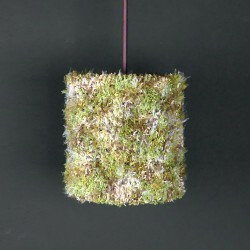 This wall lamp model is available in two versions: UP or DOWN. 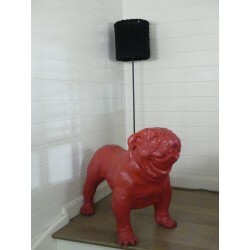 The support is made of curved metal, matt white epoxy color. The AYA shades that equip these wall lamps can also be purchased individually to be placed on wall sconces already existing in the wall. 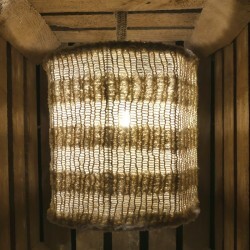 Floor lamp from the Littoral collection, Coco is a tribute to the great designer Coco Chanel. 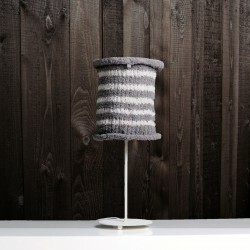 Its shade in knitted fabric ecru and taupe reminds the great time of the striped marinieres of the west coast of France. 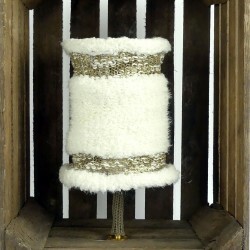 This table lamp "Girl of Saint Malo" releases all the charms of the oceanic or maritime coasts. 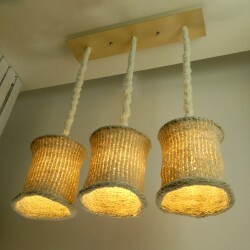 Its lampshade in marine style creates a warm and friendly atmosphere. 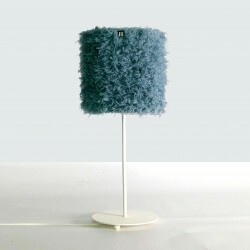 This model of standing lamp "marinière" favors the dominant mesh of blue. 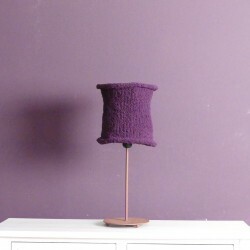 Round lampshade made of knitted two-tone mesh, ideal for ceiling lamp, bedside lamps, decorative lamp or any type of lighting down or up. JAD exists in two versions: up and down. 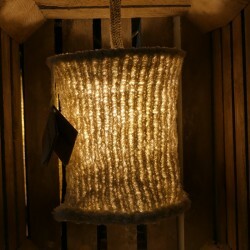 Depending on its versions, it will be able to equip lamp stands or luminous sconces. You will find the JAD in the Madrid Collection. Mossy and vegetal, the lighting Le dormeur du Val (The sleeper of the Valley) is a beautiful evocation to the poet Rimbaud and his famous poem. 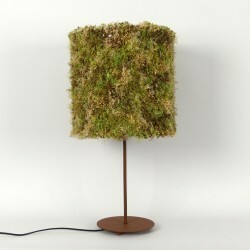 Entirely made of fancy yarns, this lamp gives the illusion of being composed of vegetable mosses, on and off. 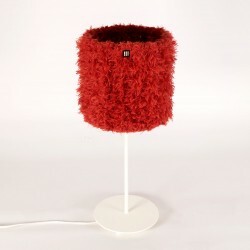 Available in 3 models: Base, Table and Floor (floor lamp).Diameter of the lampshade: 30 cm. 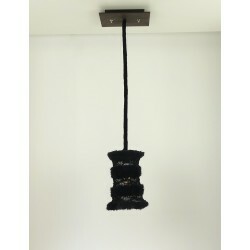 This suspension with a lampshade is the suspension version of the floor lamp Le berger de Padoue. 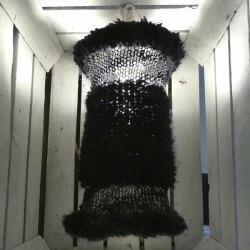 This suspension with a lampshade, "Le rêveur du Val ", is the suspension version of the floor lamp Le dormeur du Val. 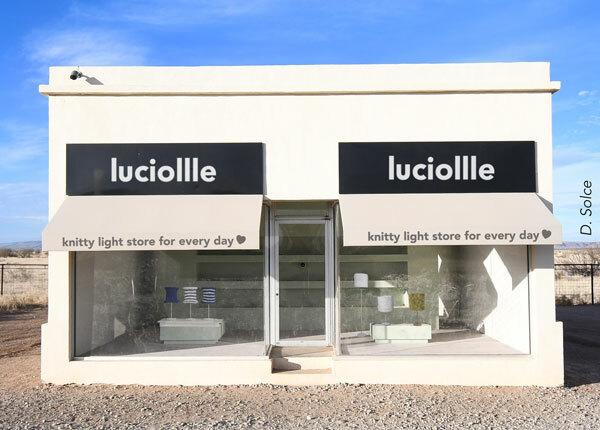 Table lamp from the Littoral collection, Leopold Zoute is an evocation of the Belgian coast and its famous seaside resort Knokke Heist. 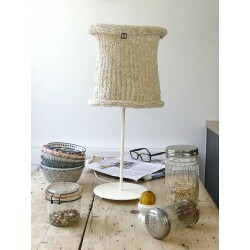 Its hand-knitted lampshades in ecru and taupe threads give off a soft and warmhearted light. 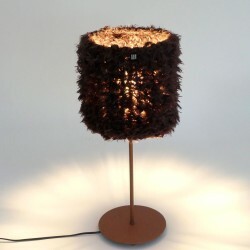 Warm and yet classy, ​​this lamp works with any type of interior: shabby chic, Scandinavian design, chic, rustic ... Its color evokes the power of the intense colors of a dark chocolate mixed with the softness of the golden light a light bulb. Available in two models: Base and Table. 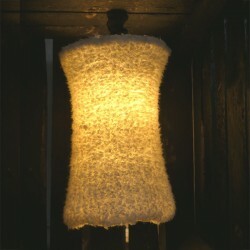 Between blue gray and duke blue, the lamp shade Little Russian blue is the sophistication made light. 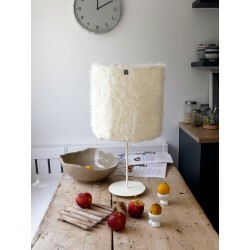 Its Nordic elegance is particularly suitable for Scandinavian design, minimalist and shabby chic interiors. 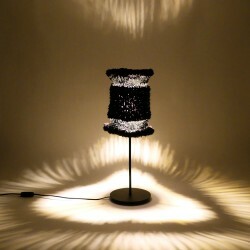 This light fits any type of use: living room lamp, bedroom lamp, bedside lamp, etc. Available in two models: Base and Table. 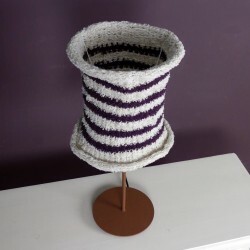 Oran Collection standing lamp.Matt white metal base, epoxy color.The tab shade in this collection is the JAD, a fully hand-made shade with mixed techniques, including knitting.